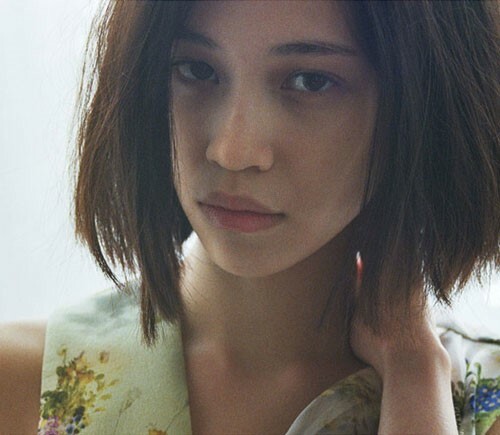 At just 20 years old, the Korean-American actor and model Kiko Mizuhara has claimed the identity of one of Japan's biggest literary heroines as her own. She plays the upbeat Midori in the forthcoming adaptation of Haruki Murakami's Norwegian Wood, a romantic, nostalgic tale that quickly attained cult status both domestically and globally when it was published in 1987. The movie, directed by Anh Hung Tran, is eagerly anticipated by fans and critics alike, after generating a buzz at the Toronto Film Festival last year. "The first time I went on set, there was a lot of pressure," admits Mizuhara, while preparing for AnOther's digital cover shoot in London. "It's such a big film, and Rinko Kikuchi is in it... and she's, just, amazing. At that time, I didn’t know that I wanted to act as I hadn’t done it before. But it was fine because everybody was so nice." Mizuhara is 5'4" and birdlike, soberly dressed in black peg trousers and a beige chiffon shirt, modishly fastened right up to her neck. Her long dark hair was cut into a bob for the film, which is set in Sixties Tokyo, and she wears it short still, eighteen months after saying her final lines. She is quiet, gentle and considered, but has deep, twinkling eyes and a resonant laugh. "My character in the film has had a sad life," she explains. "She's alone but she's still positive. Sometimes she's down but she doesn't think about it. Ken'ichi Matsuyama [who plays main character Watanabe] was so good at being sad that he pulled me into it. It was very hard, but I just had to keep smiling." It's easy to imagine that smile affecting her co-stars in exactly the same way; Kiko Mizuhara is known for her youthful and vibrant grin, which has been splashed across the front covers of Seventeen, ViVi and several Barney's campaigns. Her inherent girlishness has been her biggest selling point, but latterly she feels ready to strike a more serious note. In Norwegian Wood, Mizuhara wears cartoonish hair clips, heart-print blouses, pinafore dresses and apron skirts that reference preppy and mod styles; for this shoot, stylist Katie Shillingford has captured the evolution of her character, dressing Mizuhara in Hussein Chalayan's spring/summer collection, a strong but simple selection of dresses, blouses and skirts that encapsulates not only a clean and modern aesthetic but also a feminine, vintage feel. A flat panelled blazer enhances Mizuhara’s natural Garçonne aesthetic, while chintzy and sprig print dresses recall her innate demureness, as well as the retro-chic of her latest venture. A severely cut tabard dress is softened by a flowing white underskirt: the perfect melding of Mizuhara’s brittle looks and syrupy personality. "I love things that are cute," says Mizuhara when asked about fashion. "Today, everything I'm wearing is from Topshop. But I like Céline and I love vintage clothes – so London is a perfect place for me." Having already scoured Topshop, she is intent on rummaging through the capital's retro boutiques too. "I like to travel," she adds. "I wouldn't want to work only in Tokyo. And I love London – I love that it's so cold. When we came out of the airport with our bags, it was so freezing, it was like we were in a new world." Shot on location at Columbia Hotel. Special thanks to Junsuke Yamasaki.